On October 19, 2008, in Lisieux, France, Louis Martin and Marie Azélie Guerin, the parents of St. Thérèse, were declared “Blessed.” Seven years later, on October 18, 2015, they were canonized. It was only the second time in history that a married couple had been beatified. It is the first time that a married couple was canonized as a couple. Here are excerpts from their biographies, read during the beatification ceremony, as well as details about the beatification and their canonization. Louis Martin was born into a military family in Bordeaux, France, on August 22, 1823, and spent his early years at various French military posts. At the end of his studies, he didn’t turn towards a military career like his father, but chose to study watchmaking. However, in 1845, at the age of twenty-two, being a man of faith and prayer, Louis went to the Swiss Alps in hopes of entering a Carthusian monastery. However, he was told he couldn’t enter until he learned Latin. Disappointed, Louis went to Alençon to study Latin but was unable to grasp it. In his journal, he wrote, "I have sold my French-Latin Dictionary…" He just gave up. Whatever the full story, basically he realized that he did not have a vocation to the priesthood. He returned to watchmaking, dedicating himself to his work. Marie-Azélie (Zélie) Guerin was also born into a military family at Gandelain, France, on December 23, 1831. When her father retired in 1844, the family moved to Alençon. Zélie studied under the Sisters of Perpetual Adoration and received training as a lacemaker. She made the famous Pointe d’Alençon, and was eventually in charge of sales for her own lacemaking business. Like her sister, Marie-Louise Guerin, who was a nun at the Visitation convent in Le Mans, Zélie wanted to consecrate herself to the Lord as a nun. She met with the Superior of the Daughters of Charity of St. Vincent de Paul, but was turned away due to respiratory difficulties and recurrent headaches. A providential meeting united these two young people thirsty for the Absolute. One day, as Zélie crossed the Saint-Leonard Bridge, she passed a young man with a noble face, a reserved air, and a demeanor filled with an impressive dignity. At that moment, an interior voice whispered, “This is he whom I have prepared for you." The identity of the passer-by was soon revealed to be Louis Martin. Louis and Zélie quickly came to appreciate and love each other. Their spiritual harmony established itself so quickly that a religious engagement sealed their mutual commitment within three months. They did not see their upcoming marriage as a normal arrangement between two middle-class families of Alençon, but as a total opening to the will of God. From the beginning, the betrothed couple placed their love under the protection of God who, in their union, would always be "the first served." Their marriage was celebrated at Midnight on July 13, 1858, in Notre-Dame d’Alençon, when Louis was 35 and Zélie, 27. Compared to Zélie, a tender but undeniably domineering woman, Louis Martin seems to have been made of much softer stuff. He was a dreamer and a brooder, an idealist and a romantic. He loved nature with a deep sentimental enthusiasm. He also had wanderlust—making pilgrimages to Chartres and Lourdes, to Germany and Austria, to Rome (twice), and even to Constantinople, and planned—but did not live to carry out—a pilgrimage to the Holy Land. Along with this desire for adventure was an impulse towards withdrawal; in Lisieux he arranged a little den for himself high up in the attic for praying, reading, and meditation. Even his daughters were not allowed to enter it unless they wished spiritual conversation and self-examination. As in a monastery, he divided the day into worship, garden work, and relaxation. Zélie's lace business was doing so well that Louis sold his watch-making and jewelry business to his nephew and became manager and salesman for Zélie. They moved into the home where Zélie had her offices. Louis traveled a lot in order to get orders for the lace. He also made patterns for her, being an accomplished artist. He was often away on business, including at the time of Thérèse’s birth. There are frequent references to his absences in Zélie's correspondence. Zélie taught her children the morning offering, the simple acceptance of daily difficulties, which is the basis of the little way later taught by Thérèse. One cannot conceive of the growth in holiness of Thérèse and her sisters independent of the spiritual life of Mr. and Mrs. Martin. Towards the end of 1876, an old growth in Mrs. Martin’s breast returned. Discovered too late, the cancer was inoperable. At half past midnight on August 28, 1877, she died in Alençon at the age of 46. Louis was left to raise five children—the youngest of whom, Thérèse, was only four-and-a-half years old. Louis consulted with his elder daughters, and decided to move to Lisieux to live closer to the family of his brother-in-law, Isidore Guerin. Life at "Les Buissonnets," the new house in Lisieux, was more austere and withdrawn than at Alençon. But the most admirable work of this father was the offering to God of all his daughters. In his unshakable submission to God’s will, he considered this offering as a very special grace granted to his family. The last years of the life of Mr. Martin, "the patriarch," as he was affectionately called by those close to him, were marked by several health problems. In 1889, he suffered two paralyzing strokes followed by cerebral arteriosclerosis, for which he was hospitalized for three years in Caen. While there, he filled those around him with admiration and respect. He returned to Lisieux in May 1892, suffering symptoms of severe dementia. Two of his daughters, Céline and Léonie, looked after him until he died on Sunday, July 29, 1894, at the age of 71. On October 13, 1958, Louis and Zélie Martin’s remains were unearthed at the Lisieux cemetery. Both bodies were examined by three doctors; the only objects that remained intact outside of the bones were the Scapular of Our Lady of Mount Carmel and their metal crucifix. After the examination, their remains were placed in new coffins and then reburied behind the apse of the Basilica of St. Thérèse until 2008. On March 26, 1994, Pope John Paul II declared the Martin couple “Venerable,” leading the way for their beatification. In order to be beatified, a candidate must be credited with a verified miracle. In 2008, the Medical Commission of the Congregation for the Causes of Saints declared the healing of a young boy, Pietro Schiliro of Monza, Italy, to be “inexplicable by science and general knowledge” and was attributed to their intercession. Pietro, born on May 25, 2002, suffered from pulmonary complications following the inhalation of meconium during his birth. The unexpected healing came about on June 29, 2002, after a novena of prayers to Louis and Zélie Martin. On July 3, 2008, Pope Benedict XVI recognized Pietro’s healing as miraculous and attributed it to the Martins’ intercession. He set October 19, 2008, as the date of their beatification, and July 12 as their Feast Day. In his homily at the beatification, Cardinal Saraiva Martin, the Prefect of the Congregation for the Causes of Saints, said that the Martins were a true model of marriage. He also offered them as models for people who face illness and death. He cited Thérèse’s words from a letter she wrote, "God gave me a father and a mother who were more worthy of heaven than of earth." Among the vocations to which people are called by God, marriage is one of the highest and noblest. Louis and Zélie understood that they could become holy not in spite of marriage, but through, in, and by it, and that their becoming a couple was the beginning of an ascent together. 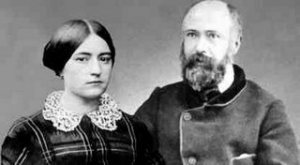 The cause of canonization of Blessed Louis and Zélie Martin progressed significantly after their beatification. On January 7, 2013, Archbishop Carlos Osoro Serra of Valencia, Spain, presided at the opening of the canonical process inquiring into the 2008 healing of a little girl named Carmen born in Spain on the feast of St. Teresa of Avila. Carmen had severe bleeding in the brain, the lungs, and the heart, and did not respond to treatment. The doctors could do nothing for her; and her parents, seeing the danger of death, immediately prayed to God and asked the Discalced Carmelite Nuns of Serra, Spain, to pray for her as well. The Carmelite Nuns recommended they pray a Novena to Zélie and Louis Martin since they had experienced the deaths of three children as babies and one at five years old. As soon as the novena began, the baby began to get better, culminating in her astonishing recovery, without any medical explanation. Within several weeks, she was completely and inexplicably cured. On January 7, 2013, they began the formal opening of inquiry into whether Carmen’s cure was a miracle attributable to the intercession of Blessed Zélie and Louis Martin. A total of eight doctors testified before the tribunal that there was no scientific explanation for her cure. Six of them had witnessed her healing at the time; two were appointed later by the investigating tribunal. The supervising judge of the tribunal said that all eight doctors joined in agreeing that the little girl should [medically speaking] have died. They also believed that, at the very least, she should have suffered significant permanent physical and psychological consequences. However, she is completely healthy today. Then, in May 2013, after all the testimony was completed, the evidence was examined in Rome—first by the medical conference of the Vatican Congregation for the Causes of Saints, then by the commission of theologians, and finally by the bishops and cardinals. They then presented the documentation to the Pope who set the date for the canonization (as previously noted, this took place on October 18, 2015). You can learn more about this holy couple by reading their letters, published in English as A Call to a Deeper Love: The Family Correspondence of the Parents of Saint Thérèse of Lisieux, translated by Ann Connors Hess. It consists of two hundred and eighteen letters written by Zélie, and sixteen, by Louis, and includes many stories about their children and their family life. You can also check out the website, www.louisandzeliemartin.org, for much more information.